Whether it’s a small or large site, a personal blog or a business site, it needs maintenance. From time to time, you will have to make some changes. You will have to introduce new features. You will have to fix an error that will come up by installing new themes, plugins, and updates. That’s something you can’t avoid, so you better prepare everything before it’s too late. While doing maintenance or designing a new site, we strongly suggest that you put the website under maintenance or under construction. By doing so, you can avoid showing an incomplete site and stay in touch with your customers. In today’s article, we are going to show you three ways of putting a WordPress site in the maintenance mode. The first method is the simplest one. If you’re in a rush and you don’t need to design a specific landing page for the maintenance mode, the following function will be your savior. Copy and paste the function into your functions.php file, change the message on the third line, and then save those changes. After saving the changes, everyone who opens your site (except the admin in this case) will see a simple message you wrote in the third line. That’s it; no settings, no images, no links. If you want more control over the maintenance mode, stick with us. While WordPress is updating your site, it will look for a maintenance.php file. If you have one in the wp-content folder, it will represent a maintenance page that will be displayed in front of visitors who opened any of the pages during the installation. This file is used just for safety reasons. While you’re doing the update, your site might become slower and even stop responding for a second. This usually isn’t a big problem. But if you have a larger audience, that one second might hold dozens, if not hundreds of visitors. Don’t risk your credibility; create a file and let your visitors know that you’re updating WordPress and that everything will come back to life in a few minutes. Your site will look much better, and your visitors will see that you created a page for that purpose instead of letting them see an error. The maintenance.php file is a temporary file, but it can still help you. Open wp-content folder, create a maintenance.php file and customize it to your likings. If you need an example on how to style the page, please see how to customize the file and quickly put your site in maintenance mode. There you will find the entire code for the page which you can quickly copy and modify to your likings and needs. Want even more control over the maintenance mode page? Then you’ll want a plugin. We saved the best for last. The Under Construction Page is a free WordPress plugin you ’ll want to handle your maintenance pages. The plugin is very easy to install and set up. If you are in a rush, it will take you less time to set up the Under Construction Page than to activate the maintenance mode we described earlier. And the differences are tremendous. 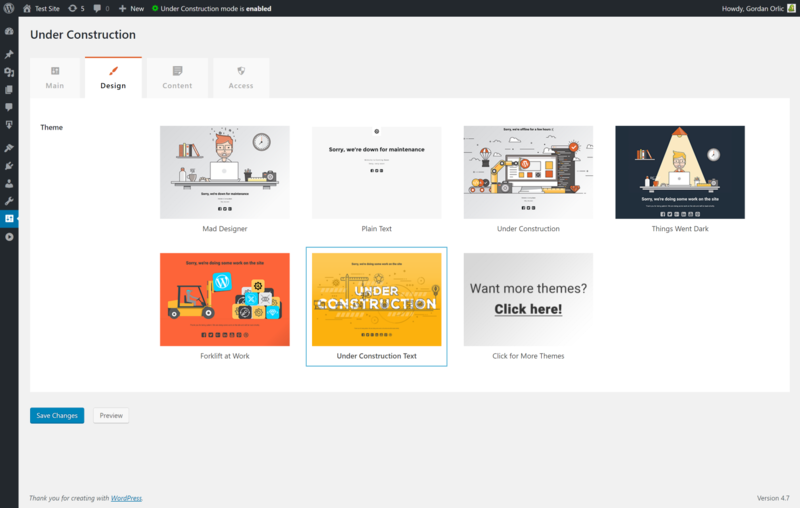 This free plugin will let you choose professionally designed templates for your Under Construction Page. Just choose the one you like and enjoy the new maintenance page. The developers are updating the plugin with new images about twice per month so you can always have the style you really like. 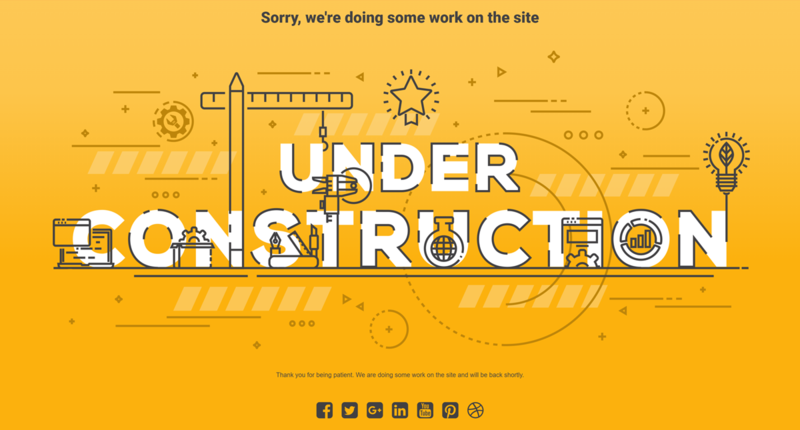 Putting a site under construction is as easy as pushing a button. 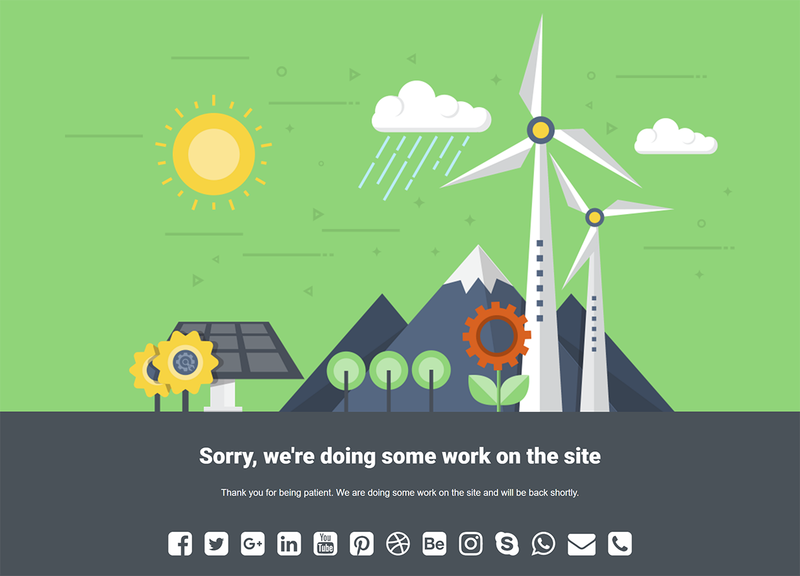 You get to modify the content of the page, and even add social media icons which will connect you to your audience while your site is under repair. Want to whitelist specific users or user roles? You got it. Want to track the page with Google Analytics? Check. Do you want to style the page to fit your site better? Sure, use the custom CSS. 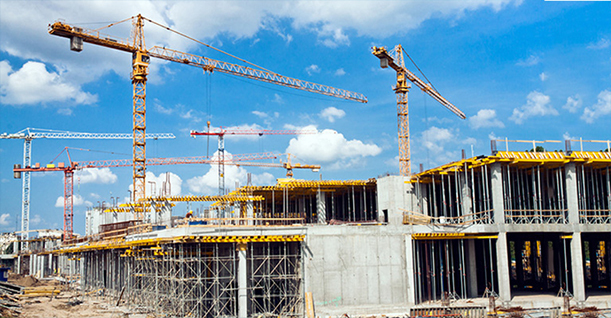 With Under Construction Page, you won’t need any special WordPress themes for the occasion. You won’t have to think about the maintenance mode ever again. Install the plugin and activate the button when you need one. Easy as that. Completely free.